Cleft grafting: placing the scion. Photo by Wes Autio, UMass at Amherst. Several grafting techniques are possible. The one to use depends on the conditions under which the grafting is to be done. Whip grafting, sometimes called bench grafting, is one of the most common. Cleft grafting is the technique most frequently used in top working an apple tree. Other grafting techniques are variations of whip or cleft grafting. 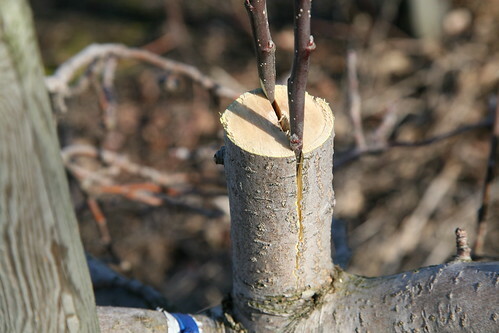 Whatever the grafting technique used, it is necessary to match as perfectly as possible the cambium of the scion (cultivar) with the cambium of the stock (rootstock). The cambium layer is a single layer of cells between the wood and bark tissues which surrounds all woody portions of the tree. The cambium divides and produces xylem cells to the inside (becoming the wood) and phloem tissue to the outside (becoming the bark). The cambium is the source of all growth in diameter of the woody stem. For grafting to be successful, the cambium of the rootstock and the cambium of the cultivar must line up for a good union to result. Only dormant wood can be used successfully as scions for grafting. Thus, scions must be cut while dormant and grafted immediately, or held under refrigerated conditions until grafting can be done. Terminal shoots of the previous season’s growth make the most suitable scion. Shoot growth of 12 inches or more is better than shorter growth. Scion diameter should be 1/4 to 3/8 inch. Scion wood should be collected when temperatures are above freezing and from healthy vigorous trees. Scions may be cut to suitable lengths, bundled, labeled as to cultivar and packed in slightly moist peat or sawdust or wrapped in polyethylene sheets or bags. Excessive moisture will cause scions to mold. The height at which the graft should be inserted should be such that when the tree is planted the union will be no more than 3 to 4 inches above the soil line. Grafting higher on the rootstock can lead to greater dwarfing and the potential for increased burr knot formation. A general rule of thumb, is that for every inch the graft union of the finished tree is above the 3 to 4 inch height the tree will be dwarfed by about 10% from its natural tendency for that rootstock. For descriptions of images, click to view slideshow full-screen.